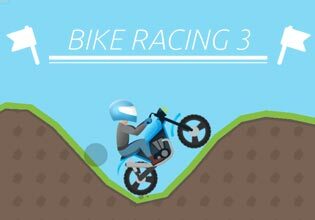 Bike Racing, the popular and addictive hill-climb racing game goes into the third round!In Bike Racing 3 you will no longer race against the clock. Pick a bike of your choice, select one of the challenging infinite tracks and try to go as far as you can without falling on your head!Each of the two-wheeled vehicles has its own advantages in the different areas. Use the scooter to cruise over rolling hills, pick the cross-bike to jump over sand dunes or try the heavy classic bike in arctic conditions!All tracks are filled with an endless number of hills and obstacles. Collect as many coins as possible, reach checkpoints and perform stunts to earn bonus coins!Spend the prize money to unlock new bikes and tracks or invest in a larger tank, stronger engine or better tires that will help you go further and to beat the ghost that represents your high-score! !Play Bike Racing 3 now for free and experience hours of nerve-racking races!